This entry was posted in List, Movie, War Movie and tagged 9 Rota, 9th Company, Admiral, Ballad of a Soldier, Ballada o Soldate, Battleship Potemkin, Brestskaya krepost, Bronenosets Potyomkin, Come and See, Idi i Smotri, Ivan's Childhood, Ivanovo detstvo, Letyat Zhuravli, List, Mongol, Movies, Russian movies, Russian war movies, Sergei Bondarchuk, Sudba cheloveka, The Cranes are Flying, The Fortress of War, The Story of a Man, War and Peace, War Movies, Waterloo. I have seen all of these. While I thought Admiral was an incredible spectacle, I thought it was a bit disappointing overall (the civil war subsumed by a love story). Have you seen 1612? I’m not surprised that you have seen them all. I know what you mean about Admiral but in this case I liked the love story and didn’t care all that much. I haven’t seen 1612 yet but I’ve got it. I’ll look for your suggestion, thank you. Thanks, Kevin. I agree mostly with your rating, maybe not for Battleship Potemkin. I hated watching it, to be honest, but still think it’s outstanding for the time. I vaguely remember Prisoner of the Mountain. My problem are the titles. I watch Russian movies with German subtitles. There is also much more available. Often co-prodcutions former German Democratic Republic /Russia. But then it’s hard for me to find the English title. Thanks a lot, Crooked Mick, I will look them up. I think I heard of Ivan Grozny. Alexander Nevsky sounds familiar too. Popped in to say that I am halfway through Burnt by the Sun 2 (3 hrs long). This is one you might want to check out. Watch Burnt by the Sun 1 first though otherwise it’ll be hard to follow. Some real life events from WWII here. Great, thanks a lot, I’ll have a look if I find it. This one is awfull. I don’t want to swear, so I can’t say much about it. I couldn’t find it anyway. It’s not likely I’ll get to it soon. I must say that some scenes from Burnt by the Sun II were very difficult to watch (the German tank scene), but bloody realism beats -“war as adventure” in Max Manus. Yes, I agree but thanks for the warning. I don’t always do well with scenes that are too gruesome. I would recommend Russian WWII movie ‘The Star’ I watched it recently and was pleasantly surprised. Thanks so much for the suggestion. I hadn’t heard of it. Thumbs up on that one! ‘Franz+Polina’ this is nice movie, besides ‘War fighter’ was awesome and also ‘sniper a weapon of retalliation’……i have watched all movies in the list. Russian movies are realistic. Love them. I totally agree with you, they are very realistic and thanks for the suggestions. This is so great. Thanks a lot. I hope I can watch it soon. Thanks. I don’t like some movies from the list, but that’s my personal opinion. But there is a small factual mistake about the great movie The Dawns here are Quiet. The women in the movie are not snipers; they are simple soldiers, AA gun operators without any special combat training. Yet they have to face highly trained German commandoes. – The Cuckoo = Kukushka (2002). Karelian front. Two soldiers, from the opposing Soviet and Finnish armies, end up stranded in the Karelian forest wilderness and are sheltered by a local Saami woman. From then on, their three-way human relationships unfold. – Our Own = Svoi (2004). Eastern front, around Pskov. Germans take a village and capture a large number of prisoners. As they shephard the column, three men manage to make an escape: a young sniper (whose native village is nearby), a politruk (political commissar), and a chekist (state security officer). They try to find refuge in the sniper’s village, which is occupied by the Germans. Great acting performance by the great Bogdan Stupka (deceased only a few months ago) in the role of the young soldier’s father. IMHO, essential viewing for any lover of war movies. These sound like great suggestions, thank you so much. I hope I can find them. Thanks so much. Arsenal (Арсенал)Aleksandr Dovzhenko, 1927. World War One, Revolution and Civil War in Kiev.Okraïna (Окраина)Boris Barnet, 1933. World War One and Revolution seen by the inhabitants of a small town.The Forty-First (Sorok pervyy, Сорок первый)Grigoriy Chukhray, 1956. In the Kazakh desert during the Civil War, a Red sniper falls for her prisoner, a White officer.The Ascent (Voskhozhdeniye, Восхождение)Larisa Shepitko, 1977. A parable on moral decay and resistance during the German occupation of Belarus.Twenty Days Without War (Dvadtsat dney bez voyny, 20 дней без войны)Aleksey German, 1977. A journey through the illusions of war propaganda. Aleksandr Dovzhenko, 1927. World War One, Revolution and Civil War in Kiev. Boris Barnet, 1933. World War One and Revolution seen by the inhabitants of a small town. Grigoriy Chukhray, 1956. In the Kazakh desert during the Civil War, a Red sniper falls for her prisoner, a White officer. Larisa Shepitko, 1977. A parable on moral decay and resistance during the German occupation of Belarus. Aleksey German, 1977. In 1943, a journey through the illusions of war propaganda. Well, I haven’t seen them. Thanks for the list. You give me a lot of titles to track down. Twenty Days Without War in particular is a fantastic piece of cinema. Alas, there’s only one DVD edition with JP subtitles… but it can easily be found online with its title in Cyrillic, as well as EN subs (which may need a little tweaking). Prisoners of the Mountains (1996) on the empathic-tragic side. War (2002) on the cynical-nationalist side. Any idea of a movie that was from the black and white days it involves a female train engineer, I believe she became a Russian national figure. It doesn’t ring a bell but maybe someone else remembers. P.S. In any case not watch movies “Stalingrad” by Fyodor Bondarchuk (son of Sergei Bondarchuk) and “Burnt by the Sun” by Nikita Mikhalkov – It’s just a stupid joke and trolling people and checking the adequacy of contemporary Russian society. Our society has successfully met the test and these idiotic movies caused storm of indignation among the majority of viewers. Thanks, Pavel. Some of these movies look really interesting. I’m so glad you’re saying this about STalingrad. I started watching it and I couldn’t get through. I thought it was awful. I even meant to write something although I haven’t finished it. I haven’t seen Burnt by the Sun but I’m not keen on it now. Hmm… the list is interesting but not unexpected. I am sad that 9’th company shows up. Honestly, there’s nothing special about it, other than the fact that it’s a Russian war movie done in a more western style, looking like “Full Metal Jacket”, “Platoon”, and “Pork Chop Hill” in turn. It’s not that great as a movie or as a historical piece. The real battle of Hill 3234 would have been far more incedible, for all the paratroopers were wounded, but only 3 died despite the absolute best efforts of all of Afghanistan to kill them. I think than Afghan Breakdown (Афганский Излом) should be on there, being called by veterans, the most realistic and accurate film about Afghanistan, It’s also a good piece to watch, though i wouldn’t recommend it as a date movie. I think of it as being somewhat like a predeessor to Spec Ops: The Line in terms of how it starts out looking like a typical war movie before it spirals into increasingly morally grey territory before ending unhappily, contrasting to how television wars end, with helicopters firing some missiles at invisible enemies, never doing any wrong before flying off into the sunset to go home. Thanks for your comment. I haven’t seen Afghan Breakdown – I guess I should watch it. 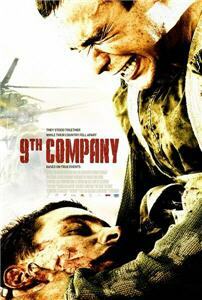 Personally, I think 9th Company is very similar in some ways to the US movies you mention but not in the way it treats emotions. I found the exchnage on their fears and other elements very different from anything you’d see/hear in a US movie. Otherwise – sure it’s similar. Its an impressive list sir. I have watched some of it and the rest I think I will be checking my netflix if they have good copy. They are all well worth trying. Not a bad one on this list. A quiet outpost (tikhaya Zastava) – I really liked this one, situatted in the troubled afghan-tadshik-border region after the breakdown of the USSR. Resembles actual historical incidents. Just another anti-Russian movie. And yes, it is weird that Russian create anti-Russian movies. FYI – in case of penal battalions people ‘fallen out of Stalin’s favor’ means deserters, cowards, and such. And serving in Shtrafbat was not a death sentence. Yes, Shtrafbats were sent to most dangerous missions, but only if they were around. If not – regular units would be sent. So ‘dangerous’ does not mean ‘suicide’ here. I someone truly fell out of Stalin’s favor – he would not get out this easy. I’m interested to watch it anyway. I did not see Shtrafbat as an anti-russian movie at all. That would be a very shallow and short-sighted way to look at it. It is probably not even anti-Stalin. I think it adds some perspective. It wasn’t all brotherly love and heroism in the 1940s. also, please be aware that I do not think for a second taht ANY movie about war is completely propaganda free. Especially not American ones. But the Americans have Oliver Stone, too. Thanks for this, Jack. I’m very grateful for these suggestions. There’s often that propaganda issue with Russian movies, but keeping that in mind, makes them worthwhile nonetheless. I hope I can find the first two you mention. I hear you. There are many movies from those countries. I try to always give the English titles. I strongly recommend to watch movie “Maksim Perepelitsa”. It is easy to find it in YouTube. Thanks a lot for the recommendation. I’ll have a look.